Discussion in 'Creative Archive' started by Ked, Sep 8, 2010. I do know how to spell, I just like the name like that. So I started drawing some Pokemon recently and wanted to post them here. I might start drawing other things sometime, but for now only Pokemon (plus that awesome turtle)! Anyway, here are the pretty pictures! I will really appreciate some feedback on these. I'll add more as I make them. Requests will be open soon. I can't make them tranparent, so I add the black border to make them look nicer. These are CUTE. Love it. But... Buneary's arms look a little short. And Manaphy's head looks a little lumpy, and one of the eyes is a little long... BUT... Manaphy is my favorite. I also love Skitty and Umbreon. Supah Cool Miji is supah cool. And the turtle... So cute. I actually didn't remember the re-heads when I made these, they just look cuter with big heads. The one eye is shorter because it's supposed to be farther away, on the side. Little Miji is based off of a drawing I made in black and white. It's supposed to be like, "No cameras PUH-LEEZ!" And Magpie, please don't say "I like turtles. ", or anything relating to zombies or Jonathon because I really don't like that, and have to deal with my brother saying that ALL DAY. As for making the backgrounds transparent, I think they look quite nice on the white background with the black boarder. It makes them stand out more. What programme do you use for drawing these? Yeah, it does, so please don't make it worse. You can hug him, unless you are a camera, which I doubt you are. I think they look nice on white, alot of members here just make their things tansparent though. As for the program, I use Paint. I just finished this cool little Miji avatar for myself! It kinda reminds me of those little Mystery Dungeon things that show up when a Pokemon talks. Everyone looks so cute with their big heads. Drifloon, Piplup and Mijumaru are my favorites. And that turtle's pretty frickin' cute too. Anyway here's a little thing I did as a present for Magpie. These little thingg will be availible for only a short time! I'll make 5 requesters one of these little things with a Pokemon of their choice, otherwise they're for select members ONLY! Next little thingy like the one above will be a Spinda, for Virgil. Well, if you are taking requests for those freaking adorable little things then I will have to make one. Just an Umbreon, please. I loffles my Lunara. AWH! I see nothing but SQUEEEE! Okey-dokey, let's see... Your Miji avatar is, like... Perfect. Just PERFEEECT. I like his little mouth, and the way he's just, like, all adorable. OMG. Magpie's Manectric... cute. I love that little wink... I just love that little mouth... NOTHING BUT CUUUTE. I see no flaws... None. They're perfect! Requests? Must make... Lessee, Lucario, if you please. Ares will look nice in cute form... Thanks in advance, and keep makin' cute arts. They're awesomesauce. I have completed your requests! Next up we have Kerauno and Ares! I believe this one came out quite well for my first ever attempt at drawing Lucario. Except... (It PAINS me to have to complain...) Can you make his eyes red? That's all. Nothing else. Thanks. I changed it to be red-eyed! I CAN'T BREEEEATHE. HE'S SO CUUUUTE. *ahem* Thank you so very much. I love it! Personally I like the black-eye version better, but oh well. Anywho, I just finished that little Spinda thing I said I would make for Virgil. Hope you like it Virg! Ked, those are among the cutest pics I've ever seen and definitely the best chibi scratches of all time. Wow, I just have so many famous Charmsians coming in here! Weird, I started making these less than 5 days ago and they're the best (as of Black Rock Shooter's opinion). Anyhoo, I'll start working on Absol later. I'm just warning you that it might not be too good because I've never attempted any Absol-related drawings. *Rules and regulations apply. Please limit one request per person. A raichu! With a tuft of hair like the one pichu brother? ehem. keep up the superamzingcuteness!! so that I could advertise for you? I've been busy today so the requests will be done tomorrow, maybe around noon or later (EST). And Shiny Eevee, to me you're famous since I've been stalking 'Charms for YEARS and see your name all the time. Which version of shading do you guys like better? Smooth (like the avvies) or scratchy (like the pictures)? REQUESTS ARE CLOSED UNTIL FURTHER NOTICE! I'll still be making pictures and other stuffs you can use though. They would've been done earlier but I had my first soccer game. Anyhoo, here are the avvies! I can change it to have black eyes if you want. I hope you like 'em guys! These were my first time attempting to draw those Pokemon, so hopefully they're what you wanted and not deformed or anything! You're welceez! I'm glad you like it! Whenever I post one of those avvie things, feel free to use it even if you didn't request it, As long as you give credit (shown previously by Shiny Eevee). I might start making new things soon, I'm un-decided. When/if you start to do new ones, can I have a Luxray? By the way, the turtle is AWESOME. Here's you're Luxray AnSo (do you mind if I shorten your name like that?)! I hope you like it! I never drew a Luxray before, so tell me what you think. Wow dude, these are pretty awesome! That is the best thing I have ever seen, and yeah, shorten my name all you want, haha. I'll change it in a few days- I have to keep my avatar until Wednesdsay cause someone is doing a sprite based on my current avatar. You're epic. Yes, I am quite epic. Anyway, I just finished my first sig! can i have a rilou please ked ? I did look at LoN's tutorial somewhat to make it. Most of it was just me playing aroung with some of Gimp's features, which are new to me because I just downloaded it. Pokefin, I'll get working on you're request tomorrow. Sigs are available for requests to Padawans or higher, along with Mods. I put alot of work into that sig and don't want people that joined 5 minutes ago getting 'em. WHOA. LIKE, WHOA. NICE SIG. Seriously, it's very cool. Very bright, and sparkly, and pretty~ One thing to say: A border. Black works best, but you can do whatever cuz it is your sig. On another topic, your recent avvie's are sooo cuuute. Especially the Luxray, and the shiny Eevee. Cuuute, and excellent work, as always. That is the cutest way possible to draw a Dark-Type PokeMon, Ked! I Absol-utely *boom tish* love it! I'll definitely use it as my avvie, but yeah, I'd rather that you turned the eyes to black. The red is cute too but it doesn't suit the face very well IMHO. These are utterly adorable. You can probably take any Pokemon and make it squee inducing. MUST HAVE! 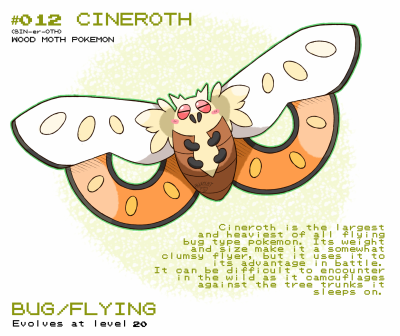 Can I please have an avvie of (you guessed it) Mothim? I can't wait to see him look even cuter! Also, the text on the sig thing looks a little off. The background is amazingly pretty though and I feel that you have a future in sigs.